X. Zhang, T. Hickel, J. Rogal, S. Fähler, R. Drautz, J. Neugebauer. 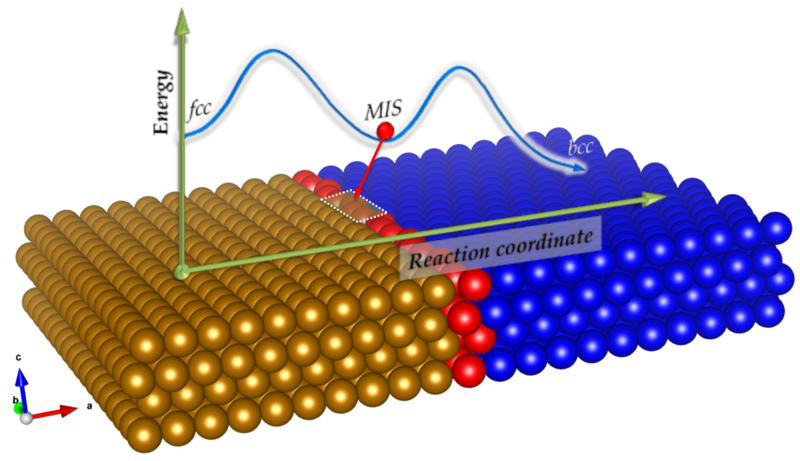 Schematic representation of the metastable intermediate structure (MIS, red) that serves as an interface reconstruction simultaneously providing a lattice correspondence between austenite (fcc, gold), ferrite (bcc, blue) and cementite in Fe-C alloys. Structural transformations in Fe–C alloys are decisive for the mechanical properties of steels, but their modeling remains a challenge due to the simultaneous changes in Fe lattice and redistribution of C. With a combination of the orientation relationships between austenite, ferrite and cementite, we identify a metastable intermediate structure (MIS), which can serve as a link between the three phases. Based on this framework, different mechanisms depending on the local conditions (C concentration, strain, magnetism) are revealed from ab initio nudged elastic band simulations, which allow us to construct a unified theory for the structural transformations among austenite, ferrite and cementite.